At this tiny ice cream shop on the Historic Sonoma Plaza, punny flavors like Chex Mix-a-Lot and A-lot-a-choco-lata are not just fun to order but also creamy and decadent. 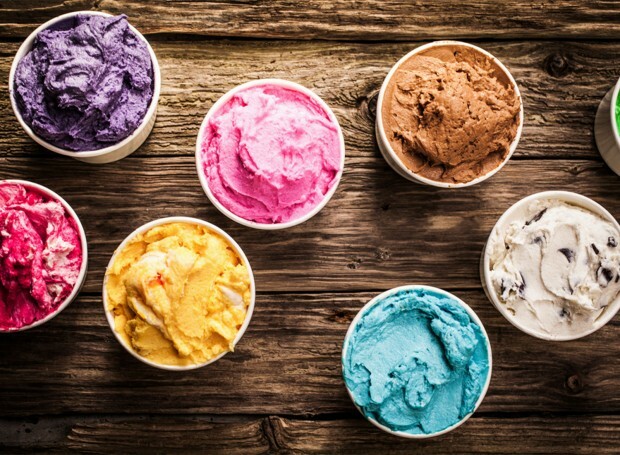 There are plenty of incredible flavors to choose from, so opt for the sampler size, which scoops out four different flavors. Vegans, take note: The shop serves at least two dairy-free options at all times. Now open for just over a year, Sweet Scoops has taken the town by storm, rapidly becoming the place to go for cold, delicious and refreshing, sugary delights. The menu's long list of ice cream flavors, all concocted on-site, are a befuddlement of the senses, and come in vegan varieties as well as traditional. Treats range from old-fashioned scoops stacked high in a cone, to newfangled ice cream cakes of epic proportions. THANK YOU THANK YOU THANK YOU THANK YOU FOR VOTING sweet scoops best ice cream!!!! In 2015, the Hencmann's purchased what was once Grandma Linda's ice cream parlor, and have since turned it into the new Sonoma classic: Sweet Scoops Ice Cream. ARTISANS :: 4. Lavender fig ice cream at Sweet Scoops. Sonomans are crazy for this homemade ice cream spot on the square, which always has 22 flavors, from simple vanilla to lemon custard and Mexican chocolate. This all started with a dream – and a Google search, where they found Grandma Linda’s Ice Cream shop listed for sale. I love helping small businesses tell their visual stories and I'm super proud of how Sweet Scoops has used the images that I created for them. They recently redid their website, they use the images on Instagram, in marketing materials and in promos. Oh Sweet Scoops, you have won my heart! This locally owned ice cream shop sits in the heart of the Sonoma Plaza and it couldn’t be any cuter. A blogger trip wouldn’t be complete without ice cream! Sweet Scoops Ice Cream, also located on the Sonoma town square, is always my choice. It’s super cute inside and their ice cream is so good! "They have traditional flavors and some unusual flavors: great ingredients, and some of the best ice cream ever. Consistently wonderful home made ice cream. We LOVE going here to satisfy our sweet tooth. Definitely recommend it." You can taste when something is made with love and this ice cream most definitely is! Outstanding customer service and a fun atmosphere made for such a sugary sweet experience. Bravo!